It’s been a busy few weeks here at the Clock Tower and Memorials project visiting potential venues for our touring exhibition about Coalville’s war memorials and getting to know more about the different organisations and places that embody the community spirit of the town. We’ve also been training up pupils at Belvoirdale Primary School to help with the collection of people’s memories of Coalville of old. Once again, Steve Duckworth and Stuart Warburton from the Coalville Heritage Society stepped into the fold and talked to the young interviewees about the different ways we learn about history – books, museums, libraries, painting, films and songs as well as by stories passed down from one generation to the next. 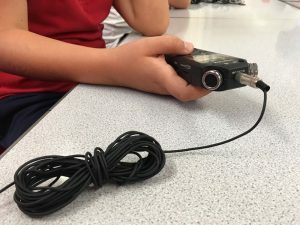 The historians also explained how people’s memories can be recorded and stored in a Records Office so that they can be listened to by researchers and the public long into the future – which is what we hope to do with the memories we record at Hermitage FM on Tuesday 10 and Wednesday 11 July. We’ve already had some interesting conversations with people recalling the way in which the town has changed over the years and some of the traditions which have come and gone. The old Post Office and market around Memorial Square feature heavily and of course memories involving the Clock Tower and past memorial services are close to people’s hearts. One interviewee, aged 82, can remember singing in the choir at the unveiling of the WWII memorial in 1950 as a young boy – and getting soaked through to the skin in the rain! His vocal talent earned him a singing role at the Festival of Britain in London, where he sang Rose of England. 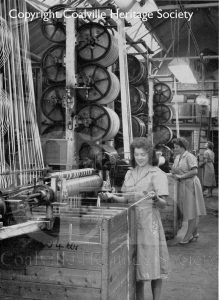 Peggy Leeward, 85, has fond memories of the Clutsom and Kemp factory, where she used to work the twilight shift in the dye house and waiting for the bus to Loughborough at the stop beside the Clock Tower in order to go shopping to buy clothes in the ‘new look’ Dior fashions of the day. Peggy also recalls taking part in the Monkey Parade, which left from the Rex cinema and circled the Clock Tower – as a means of catching someone’s eye and potentially making a date. Peggy met her future Ronald on the Parade and they married in 1953. If you have memories to share, particularly those which feature Memorial Square, but also about the places you worked, shopped and hung out in your younger life, we’d love to hear from you and book you in for a recording session on Tuesday 10 or Wednesday 11 July. We’re also working with Coalville Heritage Society to take copies of old photographs, programmes, or other objects which might help inform our exhibition about Coalville’s memorials. These will all be handled with the utmost care and returned to you safely. Please get in touch if you’ve got anything of historic value to share. Charles Booth Centre in Thringstone will be one of the venues for our touring exhibition later this year. This former farm house was converted by the eminent social researcher Charles Booth and bequeathed to the community in 1911. 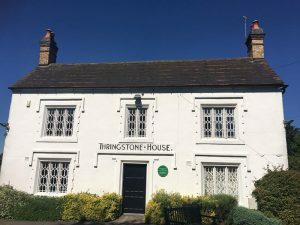 Today, this stunning facility is managed by the Friends of Thringstone and continues to serve the community with a nursery, arts group, amateur dramatics, the Royal British Legion Whitwick branch and many more activities and events taking place throughout the year.